Yellow Birch (Betula alleghaniensis) | Also known as American birch, Quebec birch, hard birch, silver birch, and swamp birch. Grows in Canada and eastern United States. Appearance: Straight grained with a fine even texture. Reddish brown heartwood and light-yellow sapwood. Physical Props: Heavy, hard, strong, and stiff. High shock resistance, bending and crushing strengths. Steam-bends very well. Has low dimensional stability and decay resistance. Working Props: Machines well but is somewhat difficult to work with hand tools. Pre-drilling required for screwing or nailing. Glues, stains and finishes well. Uses: Excellent turning properties - used for spools, bobbins, shuttles, dowels, bowls, etc. 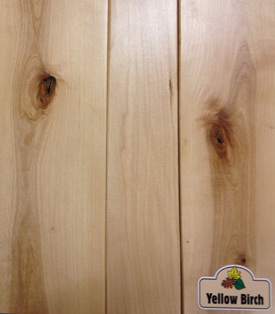 Highly valued for plywood, paneling, furniture, and cabinetry. Other uses boxes, baskets, woodenware, cooperage, flooring, interior finish, doors, fixtures, and musical instruments. Comments: Resembles maple and is often used interchangeably with it.